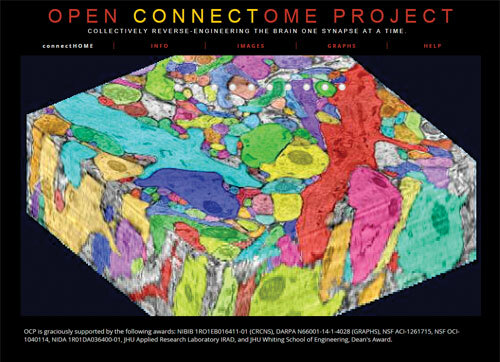 Well, you certainly can’t charge the people behind the Open Connectome Project with lacking ambition: the tagline for the project is “Collectively reverse-engineering the brain one synapse at a time.” Easy, right? The mission of the project is to bring cutting-edge neuroscience research to anyone with computer access, regardless of training or background. Datasets on the website primarily consist of electron microscopy (EM) and magnetic resonance (MR) imaging data and currently include data from mouse primary cortices, two nematodes (C. elegans and P. pacificus), human, and fly. The website includes a few informational videos on connectomics and data-intensive computing for neuroscience, as well as pages to explore the data and download various graphs derived from the data. Finally, the website offers an impressive list of links to open source software packages, neuroscience resources, and general science websites.